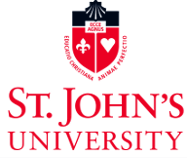 This campaign ended on November 28, 2017, but you can still make a gift to St. John's University by clicking here! Join us on November 28, 2017 for #GivingTuesday. #GivingTuesday connects diverse groups of people, organizations and communities around one common cause- to celebrate and encourage giving. #GivingTuesday is an important initiative for the College of Pharmacy and Health Sciences as it allows us an opportunity to provide additional financial and resource support for our students. These types of initiatives have allowed the College to award pharmacy and health sciences students this past October with academic scholarships to continue pursuing their academic dream. In addition, these programs assisted the College in providing 6 Book Awards to students from each program entering the professional phase of their program, as well as a Global Travel Award for students pursuing an APPE in Guatemala. It is your generosity that provides a meaningful source of encouragement for our students as they continue to pursue their academic and career goals. All monies raised in this year’s #GivingTuesday initiative will be allocated toward the College of Pharmacy and Health Sciences Dean’s Scholarship. A small $10 donation will make a significant difference in the lives of our students.